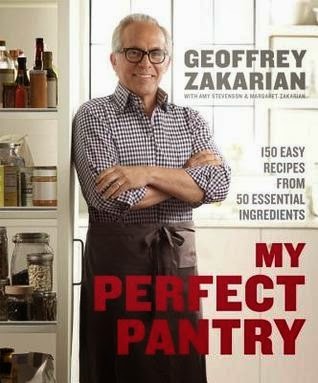 Chef, restaurateur, and Food Network Iron Chef Geoffrey Zakarian knows that the pantry is the backbone of any kitchen and the place from which every great meal starts. Forget exotic condiments and specialty foods. With a working base of 50 readily available ingredients, from oats and honey to almonds and canned chickpeas, you will always have the makings of a delicious home-cooked meal. Whether cooking in his world-class restaurants, on Iron Chef, or judging the offerings on Chopped, Geoffrey knows every great meal starts with a trip to the pantry first for inspiration. In The Perfect Pantry, Geoffrey shows you how to use your pantry to jump start any meal. When you bring home your fresh produce and proteins, you’ll have 150 recipes at the ready, and many of these can be made with pantry ingredients alone. You’ll see a simple can of beans as a Smoky Black Bean Bisque or coconut milk as Spicy Coconut Tempura Shrimp. Standard back-of-the-cupboard fare like almonds become crispy crust on a broiled pork chop; peanut butter lends itself beautifully to a spicy slaw, cider vinegar gives great flavor to a chicken main as well as to donuts, and mustard transforms a pot roast. Throughout, you’ll find quick but ingenious tips for each of the 50 ingredients, like how to use Earl Grey teabags to infuse ice cubes or a syrup for French toast. Whew! What a long book intro, huh? Well, if you read nothing else, I hope that this is the part that you do read. I'm sure it comes as no surprise that I got my fingers on another cookbook to review. I just can't seem to say no to them! I'm an addict..to cookbooks and to certain shows on Food Network. Every time I see one of those chefs, I wonder what they keep in their own kitchens. In this case, Geoffrey Zakarian was happy to show all of us what he feels are the 50 perfect pantry staples. I was thrilled to see that I keep a lot of these in my own kitchen and other than one (anchovies), I completely was on board with not only his choices, but also his recipes. There are some amazingly delicious recipes in this book and not a single one of the ones that I looked at called for some weird ingredient that I have no chance of finding out here in the boonies. It was a delight to see someone of his talents keeping things real for those of us who are not even close to his level of ability.